When you come to one of our Office locations for a drink, you’ll have no shortage of choices—especially when it comes to beer. “We showcase a variety of craft beers that change seasonally,” says Kendra Mohan, district manager of The Office. Craft beers come from small, independent breweries. They typically have an annual production of 6 million barrels of beer or less (about 3 percent of U.S. annual sales), according to the Brewers Association. They use flavors from traditional ingredients like malted barley, and brewers tend to be involved in their communities. Certain beers are unique to the spring and summer months; they tend to be lighter bodied, so they may help cool you down in warmer weather. The Office carries many local draft beers, such as those from Carton Brewery (Atlantic Highlands, NJ); Kane Brewery (Ocean Township, NJ); Brooklyn Brewery (Brooklyn, NY); Flying Fish Brewery (Somerdale, NJ); Riverhorse Brewery (Ewing Township, NJ); and Bolero Snort Brewery (Ridgefield, NJ). 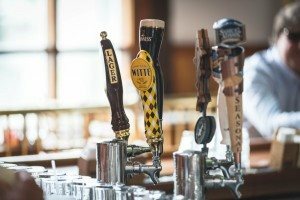 We also offer craft beers from breweries around the country, such as Sierra Nevada Brewing Co. (Chico, CA), Sam Adams (MA); and Goose Island (Chicago). Each of our locations carries different brands. With all of these choices, how can you decide what to order? No worries. We offer a flight of five 4.5-ounce beers of your choice for just $7. Cheers!